Dr. Margaret Robbins is an accomplished educator, presenter, writer, editor and reader. Fortunately, at Mount Vernon, students in grade 7 benefit from her knowledge, expertise, enthusiasm, and passion on a daily basis in their Grammar and Composition course. Committed to making learning fun, Dr. Robbins introduces creative activities that weave strategy and life skills through her PBLs (project based learning). She shares one such project, below. The first part of your task, with a design team of 2-3 people, is to create a game that will help students learn a concept related to literacy: reading, vocabulary, writing, and/or grammar. This should be either a board game that people can play in class or a video game that can easily be shared with your classmates and with me via gmail/Google Docs. Remember that all games have a storyline to them, so one skill we can learn is storytelling. In addition to creating the game itself, you will need to create specific, step-by-step instructions for how we can play it. Assume that we know nothing about your game. Also, write a two paragraph explanation of your game that would fit on the back of one telling us what the game is, what world(s) it involves, why it is fun, and why we should play it. Therefore, you are explaining the game to us, but you’re also persuading us to buy it from you. Individually, your task is to write a narrative to accompany your game. You can either write an imaginary story of someone who is experiencing your game (ex: Mario or Luigi trying to save the princess) or the story of a person who plays the game and benefits from it. The narrative story should be 3-5 pages long. In addition to a traditional creative essay, you can also choose to represent your narrative in comic/graphica form. If you are interested in another multimodal representation of your narrative, please speak with me first. 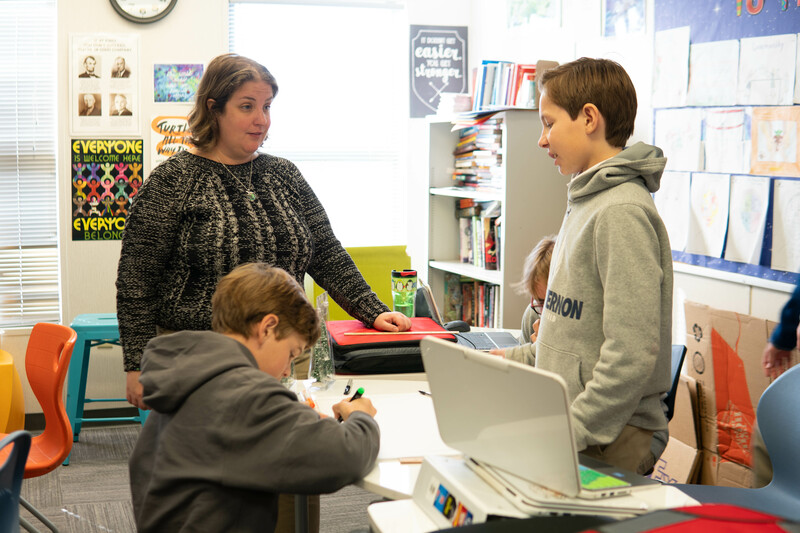 Before creating their games, her students interviewed Mrs. Edwards’ fifth graders, and Mrs. Liu’s sixth graders, as they are the target audience. Later, they visited Señora Villafañe’s class to play games her students designed as examples. Throughout the PBL, the focus was on building the games and writing the accompanying stories. The directions are clear, concise, and easy to follow; people can play the game without the makers explaining it verbally. The instructions convince people of the game’s relevance and importance. The paragraphs are structured effectively and clarify the rationale of the game and how to play it. The story is in fantasy, fanfiction, comic, or narrative/game form. Through this process students reinforced their abilities to collaborate, empathize, imagine, communicate, tell a story, instruct, and sell. I taught secondary English Language Arts in Georgia public schools for ten years and have had administrative roles for the Duke University Talent Identification Program, the Kennesaw Mountain Writing Project, and the Red Clay Writing Project. I studied Language and Literacy Education at The University of Georgia and graduated in August 2017. During my doctoral studies at UGA, I was the Red Clay Writing Project Scholar for three years, and I also worked as a Graduate Teaching Assistant and University Supervisor for the English Education focus area. I have peer reviewed publications in the SIGNAL Journal, The ALAN Review, Social Studies Research and Practice, and Gifted Child Today, in addition to one published book chapter and one book chapter under review. I worked as a Youth Writing Academy instructor for the Kennesaw Mountain Writing Project from 2008-2017, with a two-year hiatus, and served as the On-Site Coordinator for two years. I am currently back to my middle school teaching roots and work at Mount Vernon Presbyterian School, and I absolutely love the school and the environment. I continue to write and to keep two blogs, http://comicsandyalit.blogspot.com/ and https://drmargaretrobbins.blogspot.com/. I have given academic presentations at NCTE, CEE, AERA, the GCBA Conference on Children’s Literature, JoLLE, and the Critical Media Literacy Conference. I have also been a panelist for DragonCon and Conjuration on my topics of expertise, female representation in comics and Young Adult Speculative Fiction. Specialties: Teaching 6-12 ELA, Higher Education, Gifted Endorsement K-12, ESOL endorsement, Reading Endorsement 4-8, Creative Writing, Qualitative Research, Literacy Education Research, Program Management, Project Coordinating, Social Media Public Relations.